Doors Open Minneapolis is your chance to explore the buildings that tell our city’s story. From theaters to business hubs, sacred spaces to private clubs, sports complexes to engineering wonders, historical gems to not-even-open-yet buildings, Doors Open Minneapolis will give visitors a FREE behind-the-scenes look at over 100 exciting venues. We’re hoping to enrich experiences by presenting meaningful conversations with many of the people who make these venues the marvels that they are. 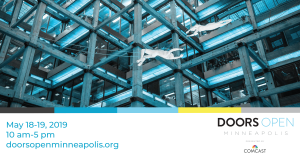 More information: doorsopenminneapolis.org.